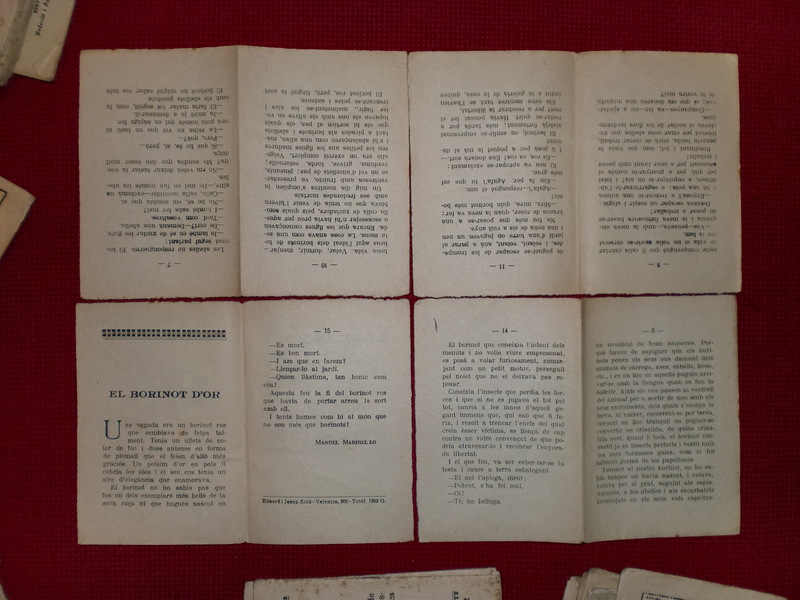 A “pliego” is a simple sheet of paper that once folded turns into a microbook (a real pocket-size one, indeed). It only needs a printer, a little do-it-yourself and an average 10 minutes for reading it. HowTo pliego from pliegos on Vimeo. What can be said on just both sides of a sheet? Imagine the smallest book possible, one that you can create writing only for a while, then upload and download straight to your printer. Where the focus is not quantity but quality, and reachable for anyone. Like it or not, small is the new big. We have less time for long texts, microblogging is here to stay and we always do things in small time-blocks anyway. So consider each pliego like a minimum knowledge unit, somehow. It can be a fiction short story but also the first chapter of a bigger adventure. Or part of a course, a module of something wider to be learnt. For teaching and learning purposes, pliegos could be a great companion of open and online courses. What about a daily or weekly diet of this kinds of short texts? 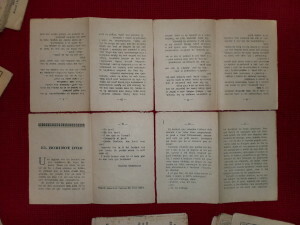 Or a cooperative written one about a certain subject, that can be reused then by others? The modular possibilities of this sort of books can be infinite. Pliegos can be collected like stamps or stickers, but once read we strongly emphasize to leave them in the public space. Like an anonymous gift for a stranger reader. Specially if they contain text extracted form the Internet: turning this way the digital into physical, like a paper bridge between both worlds. The pliegos concept is no new at all, just a 2.0 times version of something that dates back to the first presses, and the way popular fiction was cheaply distributed through the city streets in the beginnings of the Gutenberg era. The idea has to do with an unusual finding: an old suitcase abandoned in a family garage. 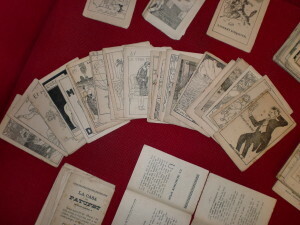 Inside, a collection of nearly 200 Catalan pliegos from between 1910 and 1915, that were produced by a nearly one-person publishing company, Patufet. This nearly yellow pages, folded and cut the same way we do here (some of them also nicely together with a red thread) tell the story of many many handmade stories and covers, thanks to the infinite imagination and good ear of Manel Folch i Torres. Fight eBooks: they’re evil! They want to erase books from shelves and turn libraries into microchips (with people inside). Using a pliego the right way means 6 steps: download, print, fold, cut, read and leave somewhere. Make the open web turn physical: many digital texts (posts, collections of tweets, Wikipedia abstracts, even mails or comments) deserve real paper, and once printed can also be a great tool for fighting the digital divide. The great “one book, one buck” opportunity: information online is mainly free, but outside Internet (in the right place and time) can be quite valuable. Nothing stops you for creating or downloading a collection of pliegos, go to a festival or market and sell them for a coin -like in the goood old times. Dedicated to all the wanna-be-writters: yes, it takes a man (or a woman) to write a book in less than 1500 words! Publish here as many as you want (not necessarily short stories, think also about serial literature) and distribute them trough your own social media channels (pliegos love tweets, indeed). Quick textbooks for mobile learners: take it as a good way for saving offline the essence of that online course, lesson, subject, etc. Summarizing knowledge has always been a main way of learning. But please don’t bring pliegos to your exams!